The project in Campbell required the works, a facelift to modernise the home, an upper floor and front extension to create extra space for their growing family, a full home renovation and remodel to improve the flow and function of the existing home and a new double garage addition. Our client’s consulted Build Professional after having plans drawn up from another company for a new garage that once priced was designed to be far too costly. With our understanding of construction, the design team improved the new garage design to make it far more cost effective without compromising on aesthetics or functionality. Once the garage design was rectified to align with the client’s budget, Build Professional progressed to design an upper floor and front extension together with renovating and remodelling the existing floor plan that would greatly improve the functionality and change and modernise the façade of the home. By removing the old ‘bull nose’ verandah and disguising the low pitch roof to the height of the second floor addition, the horizontal façade split the heights, creating rectilinear details both vertically and horizontally. A clever array of steel detailing created the horizontal awning to the front of the home as a minimalistic feature. The design was well thought out taking great consideration of the northern aspect and stunning views of Mt Ainslie creating a warm, light filled and solar passive home. Our client’s lived through the complete extension and renovation process. Build Professional developed a two stage plan to enable the family to live as comfortably as possible throughout the construction phase. Stage one consisted of the construction of the new garage, ensuite renovation and remodelling of the back of the existing home. This enabled the family to use the new garage for storage and for the family to live in the back of the existing home whilst stage two entailed the complete removal of the existing roof and the construction of the upper floor extension and front entry addition. There was a significant amount of work to coordinate and being located in a cul-de-sac and next door to a dual occupancy meant that access and space was tight including the thought to provide safe access around the construction zone for the family of five that were living through this. Firstly, we walked around with our clients to zone off the front garden and important plants from construction traffic. Materials had a location as too did the waste bins. The carport was free for access and for our clients to use of an evening. Careful attention to detailing the steel floor beams into the existing structure enabled a speedy delivery to close off the untouched wet areas below from any weather issues. We were able to keep the upper floor off the fireplace chimney to enable the possibility of a triple skin flue but offset components to use the integrity of the brickwork to load the upper floor and halve the span of the beam. This contained the steel within our parameters and design. Continuing to the rear, we detailed a steel beam to allow services from the wet areas to continue and to support the new floor areas above while maintaining existing ceilings – this eventuated into no works to the existing laundry and bathroom. Redefining the heating and cooling needs of the upper floor we were able to incorporate air conditioning into the roof structure and duct voids designed to enable vents to the required locations. From an Architectural perspective and our Design and Build process, the front of the home took a change from the 70’s to the modern era. By using vertical and horizontal elements, we gave the home a striking presence to the street. 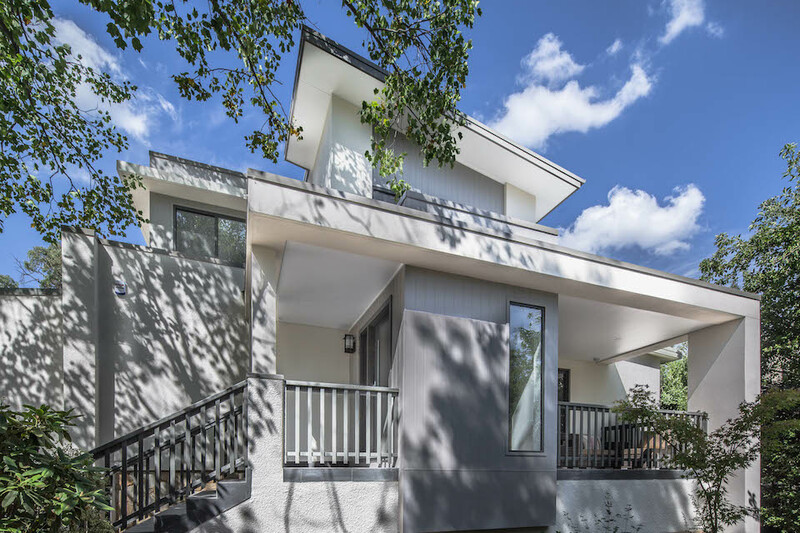 Once again, clever steel detailing enabled our design to use fine horizontal lines across the home positioned to break up the height and vertical elements of the cladding. These elements set and detailed around the use of existing brick pillars to the front porch rather than just demolishing. Including shade awnings to the windows most exposed to the summer sun gave the horizontal elements within the vertical lines of the cladding. The deciduous trees to the front of the home give great shading to the home in summer from the western afternoon sun. The final result is amazing and a complete transformation of the home. The home extension and renovation has changed our client’s lifestyle immensely. The façade of the home is striking, modern and now has great architectural interest. The flow and function of the interior has been rectified and now works harmoniously for this busy family offering much greater open plan living space in the kitchen, dining and living and offering a separate entrance. The addition of the new bedrooms, bathroom & rumpus otherwise known as the ‘teenager’s wing’ in the upper floor extension has created a separate living and sleeping zone that has future proofed the family’s home.